It has happened to all of us at least once, You put your key into your lock and turn only to feel your key break off inside the lock. This is the point you should call a locksmith before you cause damages to your lock that can’t be fixed. We have seen people that have broke their key inside their ignition cylinder and try to remove it by using screw drivers,hammers tooth picks and other items only to cause irreversible damages to their locks causing them to have to be removed and replaced at a great expense. The best advise we can give you is to call a professional first. Thank you for choosing to visit our website. 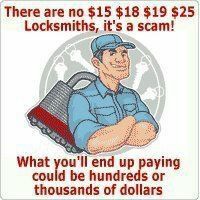 Paxton Locksmithing has decided to start this blog site to keep the general public up to date with the latest locksmith scams, advise and tips to keep you and your family and friends safe.